Researcher: it's "a completely new way to think about insect control." Most humans aren’t big fans of bugs that feed on their blood. Keeping mosquitoes at bay is a task that scientists have been buzzing about for quite some time now. Not only because the pests can be a nuisance, but also because they can transmit terrible diseases like West Nile Virus and Malaria. The quest to fend off the hungry swarms has led scientists to some innovative solutions — including the recent discovery that human diet pills can curb the appetites of some mosquitoes. The research, detailed in a new study published in the prestigious journal Cell by a team of researchers from Rockefeller University, examined the Aedes aegypti mosquitoes, which are the principle spreader of dengue fever throughout South America, Africa, and the Eastern United States. Female Aedes aegypti mosquitoes are driven to feed on human blood in order to acquire a protein they need to lay their eggs. But the researchers found that giving the mosquitoes a saline solution containing human diet drugs left the mosquitoes feeling full and without an appetite — similarly to how the drugs would work in humans. 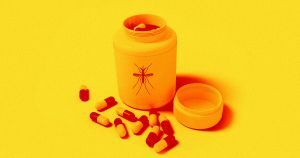 Although the study didn’t specify which drug or drugs were used specifically, it did say that the diet pills work by suppressing the Neuropeptide Y (NPY) receptors responsible for diet regulation in humans, and mosquitoes apparently. By analyzing the mosquitoes’ NPY receptors, the researchers were able to determine which ones were affecting their diet, meaning they could reproduce similar effects by interfering with those NPY receptors without the use of human diet drugs. The study has huge implications for new ways to control pest populations. Understanding ways to curb the insects’ appetites would reduce the need for insecticides, which many insects are developing immunity to and which have been tied to the deaths of both birds and bees. New population control methods would also offer alternatives to controversial gene drives, which destroy populations entirely.